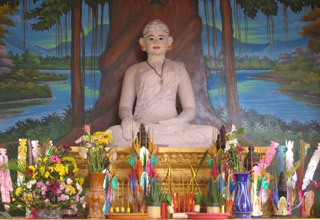 Lok Yeay Mao, the Goddess of protector, has been well-known for keeping peace and calm in forest and coastal provinces of Cambodia, Kampot, Kep and Sihanouk Ville. Visitors never fails to visit and pay respect to Lok Yeay Mao when they pass along the National road number 4 via Phnom Penh and Sihanouk Ville and in exchange granting protection and wishes for her worshipers. 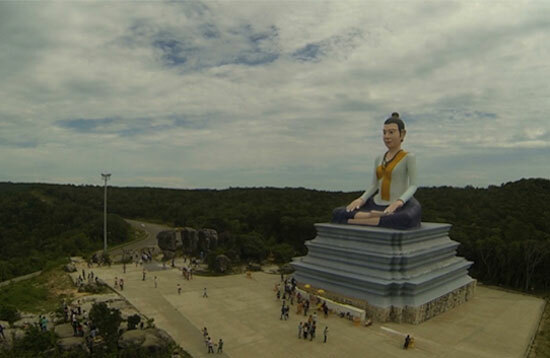 On 27 Feb 2010, to honor the respect of Lok Yeay Mao, Neak Oknha SOK Kong, Chairman of the Sokimex Investment Group, built the largest outdoor statue measuring 29 meters high on Bokor National Park. 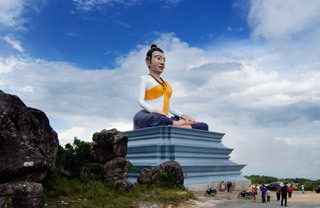 The Goddess, situated on the top of the mountain (1075 meters) overlooking the sea coasts. 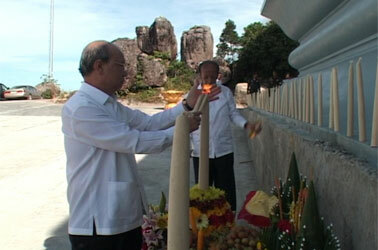 Visitors going up the mountain could not miss the statue and would stop by to pay respects to Lok Yeay Mao. It is believed that the statue can be spotted from the bottom of the foot hill. 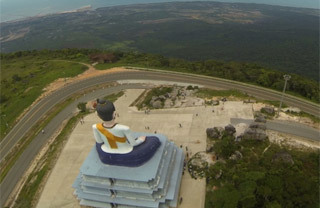 Lok Yeay Mao statue quickly became one of the landmarks on Bokor National Park, attracting numerous local and overseas visitors. 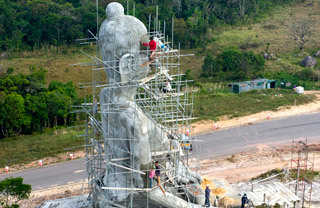 It is not only a remarkable work project, but also an outstanding piece in belief art construction in recent history. It is going to be valuable heritage of mankind. 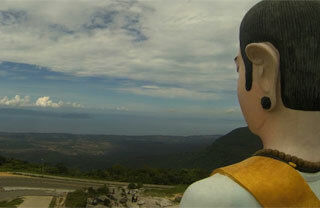 Bokor Mountain was found by the French in 1917 and developed into a resort in 1921. A catholic church as built during the development of the resort and a Cambodian pagoda, Wat Sampov Pram, were built later in 1924. 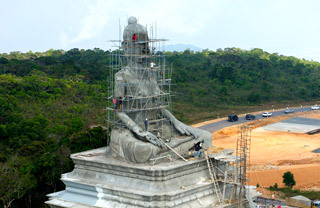 In 2008, both Thansur Bokor Highland Resort development on Bokor Mountain, and Lok Yeay Mao construction project took place. The purpose of the statue construction is to honor the spirit of the mountain and sea protector, Lok Yeay Mao, and built for local people and tourists to pay their respect to her and pray for happiness and safety. 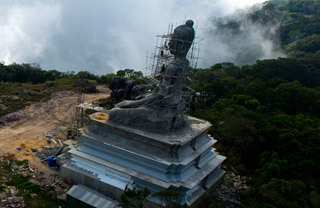 The construction of Lok Yeay Mao statue started on 27 February 2010 and completed on 03 May 2012. The statue was built by cement with 29 meters tall and 8 meters width on the high ground near the cliff. To build this magnificent statue, our engineering team had faced many challenges before achieving the notable project of Kampot province. As the construction was taking place on the hill, it took twice effort to complete it. Due to the road up to the hill is not yet completely done it sometimes required the workers to carry things by hands to reach the construction site. The transportation of the building materials also took long time from the mainland to the mountain. The hardest part of the statue design was the face. It is not only the shape of the face but also the size of the face as it is 3.6 meters, equally almost 10 times to normal statue built for selling at the art shop. 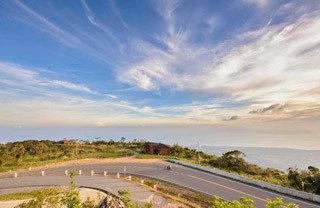 Bokor Mountain is well-known for its cool year-round weather. It is interesting place for visiting but when it comes to 2 years construction time you have to challenge your patience on there. In dry season (from October-April), the weather is quite pleasant. The construction was going well. But it turns unbearable in rainy season (from May-September) as the rain and wind are terribly strong forcing the workers to stop their works. Fog is one of the most challenges during the construction. 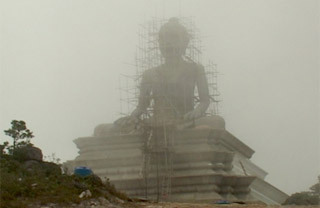 As the statue is located outdoor and on the 1075 meters mountain, it suffers heavy rain and fog, as well as the wind from the sea making it changes the color faster than normal. Our engineering team needs to repair it once every 2 or 3 years to remain the statue in good shape and color. The maintenance includes cleaning the moss and painting. The statue was originally to be completed in 1 year but had to extend to 2 years due to the weather and transportation condition. 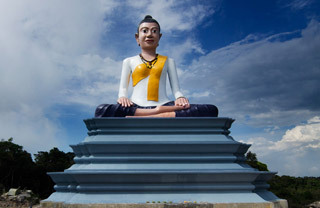 The statue is presented in a meditation posture showing calm and peaceful sitting on top of a three-platform altar. 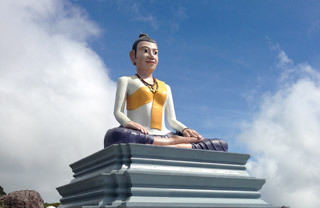 The statue was paint in black skirt, white shirt and yellow scarf; it is the symbol of nun traditional clothes. 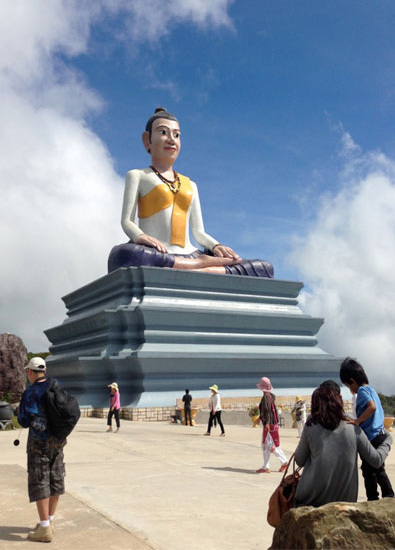 At Lok Yeay Mao Monument, guests can overlooks the breathtaking views of the vast blue sea, coastal line, offshore islands and panoramic view of the Kampot province. It is also the perfect peaceful place to enjoy the view. If you manage to pass the place during evening time, you maybe wait a while for a stunning view of the sun going down to the sea. What you have read above is a legend which has been told from generation to generation. However, some sources claim, as described below, that Yeay Mao was the supreme Commander who succeeded commander Kry. As a fully grown young woman with a dusky complexion, Srey Mao was yet to get married and held on position in the army. One day, Kry – who was the supreme commander in the southwestern region of Khmer territory covering land and maritime borders (sea zones) , including Koh Kong, Kampot and Sihanoukville, and covering part of the north western region including Pursat-appointed Srey Mao as his personal assistant. After many days and nights of fighting, commander Kry was eventually killed by the Siamese army on the frontline in Koh Kong. His death demoralized many of his soldiers. Seeing that her forces were suffering a lot of casualties deputy commander Srey Mao decided to fight her way out the siege and retreat with her remaining soldiers to Sre Ambel, and then to continue to amass forces at Pech Nil, which was a mountain with strategic advantages where they could contain the Siamese forces and prevent them from advancing. Following the death of Commander Kry, Srey Mao was appointed by the Khmer king as commander in charge of the southwestern region. Soon, Srey Mao began gathering and mobilizing military and patriotic forces and designing strategies to launch offensives, both on land and water, against the Siamese forces in the Koh Kong area, and finally succeeded in regaining complete control of the territory. Using her powerful magic, Srey Mao used armies of grass or tamarind leaves to invade every Siamese garrison. Thousands of grass and tamarind leaf troops entered every corner of the Siamese barracks putting the Siamese soldiers into a state of panic and chaos, and causing them to lose the will to fight. After the death of Chumteav Mao, Siamese forces attempted to take over Koh Kong but were defeated by the Khmer forces, who were very adept at fighting as they had been taught by their late commander Mao. Before they went into battle, the Khmer soldiers always prayed for Mao’s soul to enter their bodies so that they could become more powerful when fighting. Mao's magic power spread through every part of the coastal provinces, protecting those people who had respect for her right up until the present day. 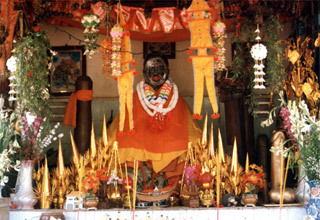 People usually offer artificial penises to Chumteav Mao at her shrines. NB: This legend is credible as it corresponds with Yeay Mao’s statue in officer dress holding a dragon club, which is typical of a courageous commander. Most recent booking for this resort: less than 24 hours ago from Thailand. Don’t miss your chance to stay at Sokha Beach Resort!